Got gun gear? Need mobile storage? Here are three handy storage solutions that can haul your stuff safely without breaking your budget. In fact, our first recommended item costs less than a buck. How can you argue with that! Here’s a great item for hunters and tactical guys. 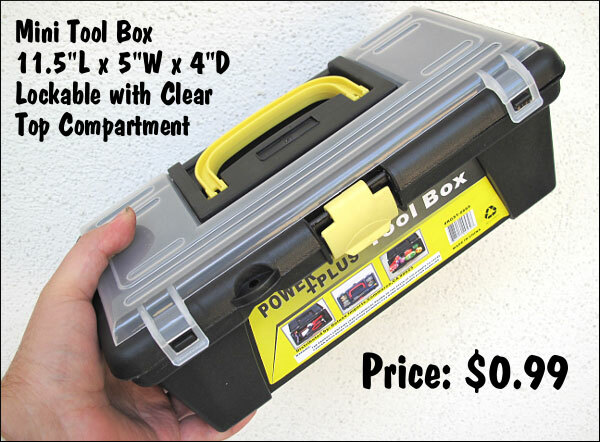 Right now, the 99¢ Store is selling a small, 11″x5″x4″ plastic tool box. The price — you guessed it — is just ninety-nine cents. Hey that’s less than the cost of a cup of coffee. We like this unit because it is small enough to fit in a backpack or large duffle bag. It can keep your pointy tools from poking holes in your pack, or provide hardshell protection for pricey items such as range-finders, cameras, and Kestrels. As you’d expect, the box isn’t perfect — the snap closure could be tighter. But the tool box does the job. It’s a very handy size, and the price is so cheap you can hardly go wrong. I bought two — one for gun stuff and the other for emergency gear in my vehicle. Note: This item is not listed online at 99only.com — availability may vary from store to store. 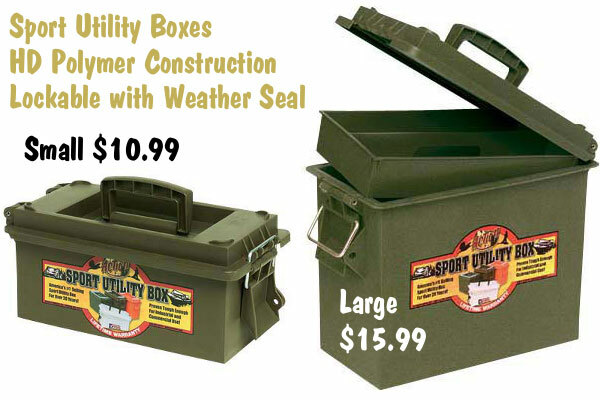 Northern Tool sells a versatile, lockable Utility Box for just $10.99. This is available in Green (Item# 26169) or Orange (Item# 26171). There is also a larger version with a top tray for $15.99 (Green, Item# 26170 or Orange, Item# 26172). We like these storage boxes. They have a rubber weather-seal, and the tupperware-type plastic is gentle on your tools or firearms. The sturdy locking system lets you use these boxes to transport handguns in jurisdictions (such as California) where a locked container is required. The smaller box can easily hold two medium-sized handguns, plus ammo and shooting glasses. It’s also nice to have a lockable box to hold expensive accessories such as wind-meters and cameras. The big box (15″L x 8″W x 11.5″H) is strong enough to sit on and holds plenty of gear. We have a few of these boxes (both large and small) and they’ve held up through years of service. If you need to haul a ton of gear, consider the Stanley Pro Mobile Chest (model 033026R). The main compartment of this thing is big enough to hold a front pedestal rest, a couple sand-bags, plus muffs and more. There’s also a small, see-through, pop-top parts caddy on top. Use that for stowing small tools, jags, patches, brushes and other supplies. 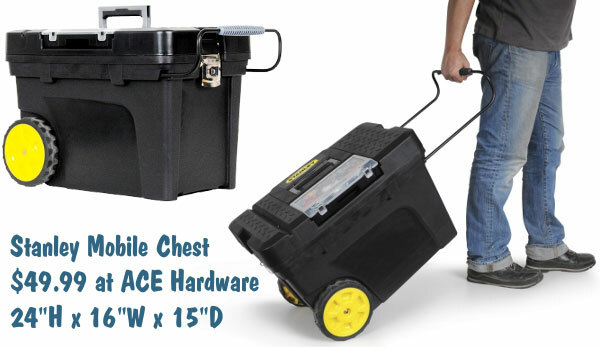 Right now you can get this (#033026R) Mobile Chest at Ace Hardware for just $49.99. You can order online and Ace will ship the unit for free to your nearest Ace Hardware Outlet. Share the post "Budget-Priced Gear Haulers for Gun Guys"
Grafs.com and MidwayUSA recently announced some attractive discounts and promotions. Grafs.com offers great prices on CCI and TulAmmo primers, plus discounted Hazmat fees. Midway offers money-off promo coupons — the more you spend, the more you save. $15.00 Hazmat Fee (reduced from $25.00). TulAmmo Primers: $79.99 for 5000 primers. (Most rifle sizes available. These primers are virtually identical to Wolf-brand Russian primers, and are made in the same factory). CCI Primers: $114.59 for 5000 primers. Price for CCI 400 (small rifle) or CCI 500 (small pistol) only. This works out to $23.00 per 1000. CCI 400 primers are used by many top 600-yard shooters. ACT QUICK — Sale ends 9/30/2011. This is a great mat for the price. We’ve used them. RULES: Codes can only be used once. Sale, clearance, out-of-stock, Nightforce and FNH products do not count towards the total and Gift certificates do not count towards the total. Online orders online. Cannot be used with any other promotion code, or combined with dealer, birthday or “Specials” pricing. Share the post "Save Money with Promotions from Grafs.com and MidwayUSA"
The best action pistol shooters on the globe are heading to Philippsburg, Germany next September. 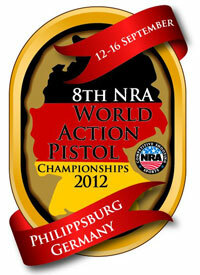 Germany was chosen to host the 2012 World Action Pistol Championship (WAPC). This event takes place every other year — Australia hosted the last WAPC in 2010. 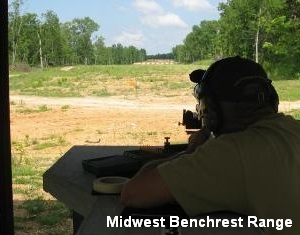 Phillipsburg, site of Germany’s largest indoor/outdoor Shooting Range, is roughly 23 miles from Heidelberg. The Schiessanlage (shooting range) Philippsburg has previously hosted IPSC German and European Championships. The format of the World Championship is very similar to that of the Bianchi Cup; everything from the courses of fire to the evening activities. Each year, the host country determines how many shooters will represent each country from the various divisions (Production, Open, Metallic). Once that has been decided, scores from the two previous Bianchi Cups will determine who represents the United States. Competitors can also receive an invitation to be part of a Ladies, Senior, or Junior team. At the most recent (2010) WAPC in Australia, Team USA dominated the competition. Amazingly, Americans Doug Koenig (1920-188X), Carl Bernosky (1920-181X), and Bruce Piatt (1920-177X) all shot “perfect” 1920 scores to finish first/second/third. We know the Europeans have been training hard, and we expect tough competition for the Americans next September in Philippsburg. Share the post "Germany to Host 2012 World Action Pistol Championship"
Smith & Wesson is replacing its President/CEO. 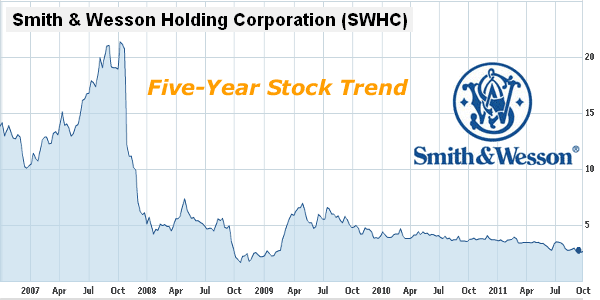 This comes after Smith & Wesson stock hit rock bottom last week, trading at $2.49 per share, a 52-week low. Smith & Wesson Holding Corporation (NASDAQ: SWHC) today announced that P. James Debney has been appointed President, Chief Executive Officer, and a member of the Board of Directors, effective immediately. The company said the executive reshuffling was done “in accordance with the company’s comprehensive management succession planning process.” Debney previously served as Vice President of Smith & Wesson Holding Corporation and President of the company’s firearm division. Debney will replace former President/CEO Michael F. Golden, who will continue as a member of S&W’s Board of Directors. According to the Outdoor Wire: “The remaining term of former President and CEO Michael F. Golden’s employment contact has being bought out by the company, but Golden will continue as a member of the Board of Directors[.] Golden’s contract is expected to impact the company’s current quarter earnings per share by as much as two cents, with the gross numbers to be included in the quarterly 10-Q set to be released after the close of the stock markets today.” Smith & Wesson stock, as of the time of this Bulletin release, is trading at $2.58 per share, gaining back a bit from the $2.49 low on Sept. 23, 2011. Share the post "Smith & Wesson Replaces President/CEO After Stock Declines"
If you’re involved with junior shooters at your club, or if you have some kids in your household, tell them to check out the new digital version of NRA Insights, the NRA publication for juniors. NRA Insights recently launched its premier digital edition on the web. Starting with the October 2011 InSights eZine, the digital editions combine stories with a variety of interactive features, videos, and interactive quizzes and games. 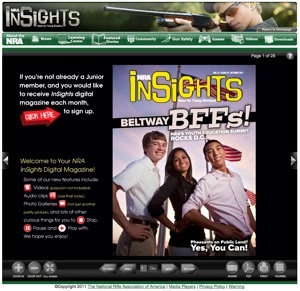 Wendy LaFever, NRA InSights Managing Editor, states: “For 31 years, InSights has covered a wide variety of topics of interest to young shooters, including shooting tips, coverage of Junior competitions, hunting topics, youth-appropriate gear reviews and inspiring stories from the young shooters themselves. Now we’re bringing the reading experience to the next level, with fun videos, interactive quizzes and cool animation.” To get a Junior membership for your young shooter, visit www.nramemberservices.org or call (877) NRA-2000. Share the post "NRA’s Magazine for Juniors Goes Digital"
Midsouth Shooters Supply has always offered a large inventory of products at attractive prices. Now we’re pleased to report that Midsouth has completely revamped its website. The new, updated site is faster AND much more user-friendly. The keyword/product search is easier to find and very fast. Products are now organized into logical categories such as: Reloading, Optics, Ammunition, Hunting, Gun Parts, Tactical, Gun Care, and Knives. There is even a prominent, highlighted tab for Clearance Items. Midsouth has also improved the way product categories are displayed. Now when you click on a type of product from the pull-down menu, a grid page loads immediately. This displays thumbnails of all the products in that category (along with price, item number, and inventory status). This makes it easy to quickly compare similar products from a variety of manufacturers. The new layout really works well. To see for yourself, try out the Binoculars Page or Laser Rangefinder Page. Sourced from an undisclosed premium bullet manufacturer, these 22-cal Varmint Nightmare X-Treme bullets are proven performers. 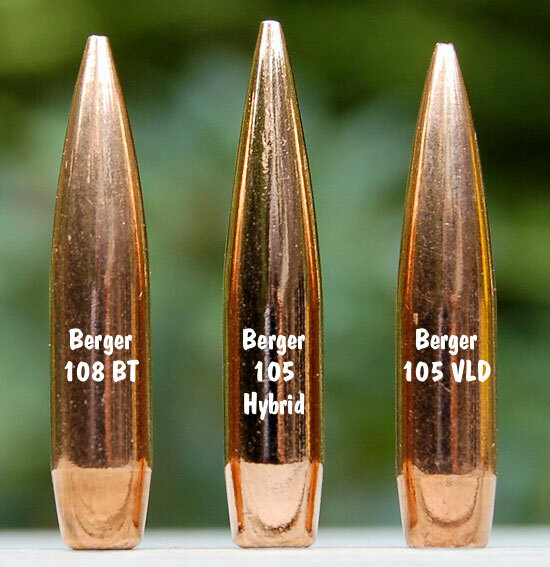 These bullets are offered in both softpoint ($46.01) and hollowpoint ($46.06) versions in 500-count bulk packs. 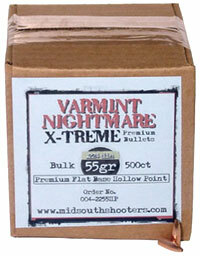 Also on sale are 500-ct boxes of .204-caliber and 17-caliber Varmint Nightmare X-treme Bullets. 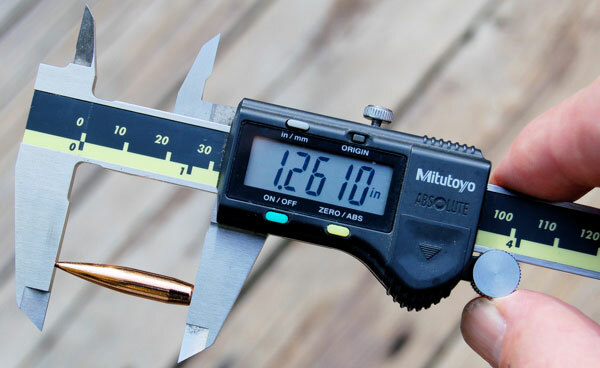 Look no further if you need a good quality, low-cost bullet for a high-round-count varmint expedition. We are often asked, “Where can I find a quality, thickly-padded soft case that fits a rifle with a 27″-29″ barrel?” Well, Midsouth offers the excellent Allen Euro case. With its 50″ length, this case will hold rifles with long tubes. Plus there is plenty of room up top for a large, high-magnification scope. This is a good choice for a long-barreled varmint rig. Share the post "Midsouth Upgrades Website With User-Friendly Features"
Put this in the “it’s about time” department. We’ve long wondered why makers of polymer-framed handguns don’t serialize the internal sub-chassis, so owners can swap frames (shells) easily without legal issues. Currently, for example, if you have a Glock and need to replace a damaged frame, you must return the frame to the manufacturer. Glock then destroys the frame and replaces it with a new frame with the same serial number. That’s necessary because the unitized Glock frame/chassis together constitute the serialized part. If you don’t want to relinquish your original frame, the only way to get a second Glock frame is to buy a new gun, and do a new DROS with background check. Beretta has come up with a better solution. Beretta realized that pistol owners might want to upgrade their frames, or have multiple frames for the same serialized handgun — one frame could have a short grip and while another has a full-sized grip. With its new Beretta BU-9 Nano subcompact 9mm pistol (to be released in October), the serial number is stamped on a separate, removable internal chassis. The polymer frame bears no serial number. As a result, Nano pistol owners can purchase additional frames without legal restrictions. Acquiring a new Nano frame would be just like buying a new recoil spring or other accessory. 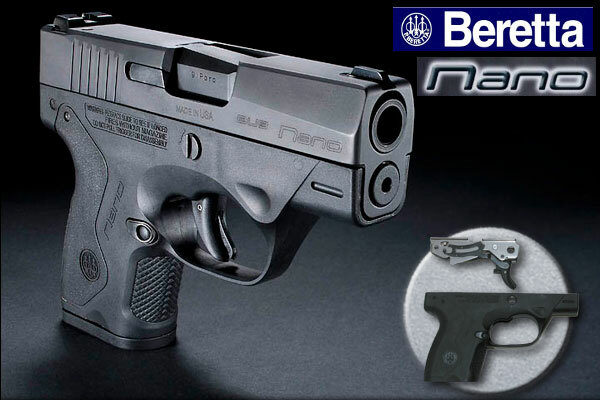 CLICK HERE for Beretta Nano Spec Sheet (PDF). We hope other manufacturers follow Beretta’s lead. Removing the serial number from a handgun’s external polymer shell allows aftermarket companies to develop a variety of frames with different features. Aftermarket frames could even be custom-molded to fit the owner’s hand. Additionally, the gun manufacturer could package multiple frames with one chassis for the original sale. That would appeal to folks who want a stubby grip for carry and a full-size grip for gun games. Along with its novel serialized “modular chassis”, the new Nano has some other interesting features, including a push-button “striker de-activator”. This allows the gun to be disassembled without pulling the trigger. Also both front and rear sights are secured with set screws. 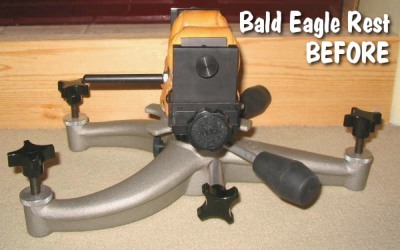 This allows a user to easily adjust (or change out) the sights without expensive tools. These features are explained in the video below. Share the post "New Beretta Nano Pistol Features Modular Serialized Chassis"
Craigslist, the #1 classifieds ad service on the web, is a source for some great bargains. 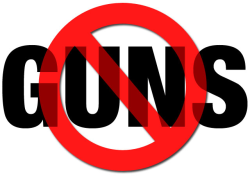 While you can’t purchase guns on Craigslist, you CAN find all sorts of hunting and outdoor gear, and shooting accessories. The only problem with Craigslist is that it’s very time-consuming to access a large region — you have to search one municipal area at a time. Well folks, there’s now a better way to use Craigslist. SearchTempest.com lets you search all the Craigslist ads in the whole country if you wish, or you can narrow it down to a state, or a designated distance from your zip code (you set the distance, such as within 50 miles or 250 miles). 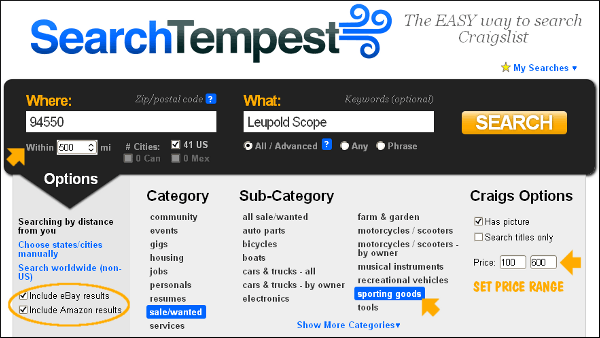 SearchTempest even lets you include eBay listings and Amazon.com listings. You can filter for price and exclude listings without photos. The SearchTempest interface is easy-to-use and intuitive. We use SearchTempest all the time and have found some spectacular bargains, all within a half-day’s drive. SearchTempest is great, but there is an even more advanced tool for computer-savy bargain hunters — CraigsPal search helper software. Once installed on your computer, CraigsPal can search all Craigslist listings nationwide or you can choose any combination of multiple neighborhoods/city/state/countries and get results sorted in single screen. CraigsPal can remember your searches and even simultaneously run multiple searches for various items — that’s a huge time-saver. CraigsPal.com offers both a FREE Version of CraigsPal and an enhanced $29.99 Members Version. The deluxe Members Version can run “autopilot” searches in the background, sending you an alert when a specific item comes up for sale. Pretty cool. CLICK HERE to learn more about SearchTempest, CraigsPal, and other Craigslist tools. 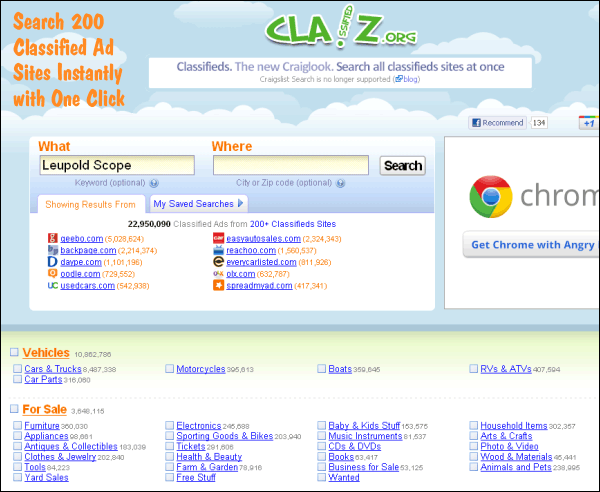 If you can’t find the items you want on Craigslist, there’s another super-fast and powerful classifieds ads viewer, Claz.org. This service, which just released a completely updated (and speedy) search engine, scans over 200 web classifieds services. These include eBay Classifieds, BackPage.com, Job.com, Geebo.com, EasyAutoSales, RVTraderOnline, SportingShopper.com and scores of other regional classifieds services. By accessing multiple classifieds web sites, Claz.org lets you search through nearly 23 million different listings nationwide. You can geo-target your searches by zip code or city, or leave the location field blank to search the entire country. We used Claz.org to search for “Leupold Scope”, and results came up instantly, with some great bargains. You should definitely check out Claz.org — it is a valuable supplement to eBay and Craigslist. Claz.org is fast and easy to use, and it can find bargains that don’t appear on Craigslist. Share the post "Find Bargains Fast with Classified Ad Helper Apps"
MidwayUSA has the Tipton 12-piece multi-caliber Jag Kit on sale again. Now through Sept. 30th, you can purchase the Kit, item 582621, for $12.99, five bucks off the regular $17.99 price. The set includes 17, 22, 243/6mm, 25, 270/7mm, 30/32, 8mm/338, 35/9mm, 375, 40/416, 44, and 45 Caliber Jags, in a sturdy box with fitted holes for each jag. This Editor owns two Tipton jag kits, one for the range kit and one for the loading room. These kits work for everything from my 17 Mach2 up to my 45/70. I use the jags for both rifle and pistol calibers. I like the fact that you can easily switch from a bigger jag to the next smaller size to adjust patch fit as the job requires. 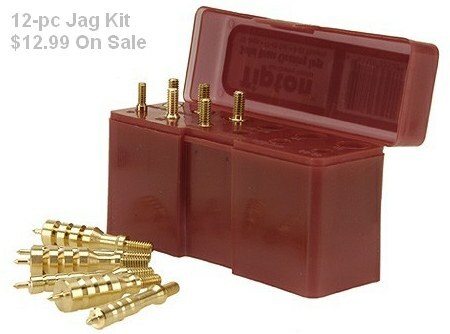 MidwayUSA also markets a 12-piece Jag Set with nickel-plated jags. This is a smart innovation that has been well-received by shooters. The nickel jags aren’t affected by solvents so they don’t give “false positives” when you’re cleaning copper fouling from your barrels. The Nickel Jag Kit, item 812503, is currently priced at $24.49, but, it also goes on sale from time to time. 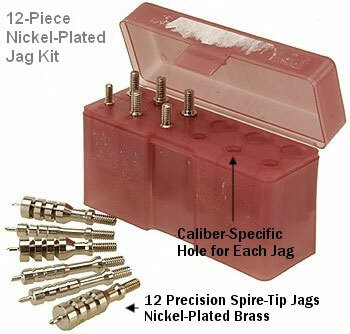 When it’s on sale, you can pick up the Nickel-Plated Jag Kit for under $20.00. Share the post "Handy 12-Piece Jag Kit on Sale at MidwayUSA"
Forum Member Rod V (aka Nodak7mm) commissioned a full-bling “Extreme Make-Over” of his Bald Eagle Slingshot Front Rest. The visual change was dramatic — a benchrest version of “Pimp My Ride”. 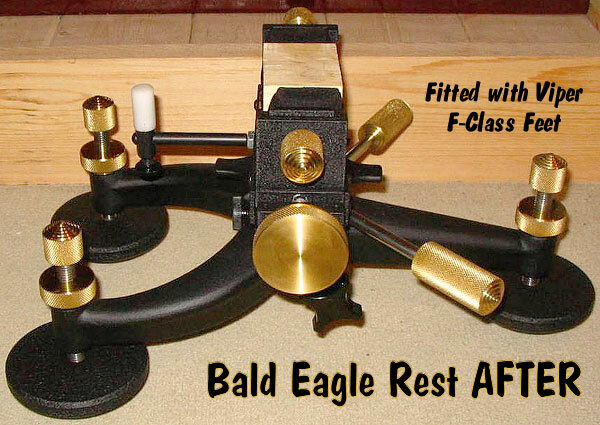 But Rod’s old Bald Eagle was also fitted out with new controls and new, large-diameter F-Class foot pads. Those hardware additions add more than flash — they improve function too. What’s involved in an “Extreme Make-Over” by Bob Pastor? Each rest is customized for the individual shooter. All the brass knobs and handles are melted down rifle cases from my foundry. Each knob and handle is individually knurled and turned on my lathe. All threaded stainless steel rods, knob screws and knob extensions are used. These are all highly polished before installation. The Viper Double-Edge F-Class Feet are 4″ wide, with a large tapered spike turned concentric to the center hole. All corner stainless steel rods are ½ x 13 threads per inch for added stability. All corner stainless steel rods have concentric points turned on the ends for use on a shooting bench. All corner holes in base are drilled and tapped for ½ x 13 tpi., from 3/8 x 16 tpi. For better stability. The base is stripped of any paint and all sharp edges and burrs are removed prior to powder coating. The entire rest is either powder-coated or painted according to the material. All threaded rods are burnished to remove any small burrs, before applying synthetic grease and assembly. All brass is highly polished, unless a matte finish is desired. Each rest is then packed in liquid hardening foam for safety during shipping. Share the post "Bald Eagle Rest Gets “Extreme Make-Over” by Bob Pastor"
The following recall and safety notice was issued on September 20, 2011 by Steyr Arms. Apparently some Steyr 9mm pistols have an issue which could allow the firearm to discharge without a normal trigger pull. The affected serial numbers are listed below. Steyr Arms, Inc. has determined a potential condition with the firing pins in a very limited number of 9mm Steyr M9-A1, C9-A1 and S9-A1 pistols that could possibly allow the pistol to fire without the trigger being pulled. 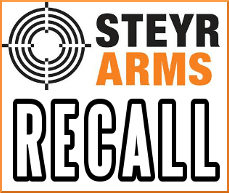 Although Steyr Arms, Inc. has not received any reports of accidents or injuries, it is voluntarily initiating this recall to protect the safety of its customers because of the remote possibility of an unintentional discharge occurring. The affected M9-A1 pistols bear serial numbers 3021926-3021928, 3021932-3021935, 3021946-3021955, 3021966-3021988, 3021990-3021993, 3021995-3022001, 3022003-3022005, 3024663-3024672, 3024683-3024688, 3024690-3024702, 3024704-4024712, 3024733-3024738, 3024741-3024742, 3024802-3024811, 3024852-3024871, 3024882-3024901, 3025299-3025308, 3025311, 3025313-3025333, 3025335-3025338, and 3025353-3025359. The affected C9-A1 pistols bear serial numbers 3022128-3022145, 3022152, 3022169-3022171, 3022174, 3022176-3022178, 3022180-3022201, 3022203-3022218, and 3022845-3022854. The affected S9-A1 pistols bear serial numbers 3022929-3022931, 3022933, 3022935-3022937, 3022975-3022977, 3022988-3022991, 3022993, 3022995-3022996, 3024146-3024175 and 3024354. Only the M9-A1, C9-A1 and S9-A1 pistols with the serial numbers identified above are affected by this recall. 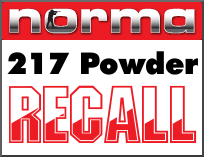 If your pistol has a different serial number, it is not subject to the recall. Step 1 – Contact us at 205-655-8299 (Monday-Friday 8-5 Central Standard Time) or at www.steyrarms.com/contact and provide the model and serial number of your pistol. Step 2 – After confirming that your pistol is subject to this recall, we will send you a prepaid overnight shipping box with instructions so that you can return your pistol to us, free of charge. Step 3 – We will replace the firing pin in your pistol and return it to you overnight free of charge. We will make every effort to return your pistol to you within one week of receiving it. Share the post "Steyr Arms Recalls 9mm M9-A1, C9-A1, AND S9-A1 Pistols"
Plastix Plus, a Cypress, Texas-based business founded by a volunteer fireman, is a leading builder of custom storage systems for Fire Departments, Police Agencies, Emergency Response teams, and Federal Agencies such as the U.S. Marshals and the FBI. 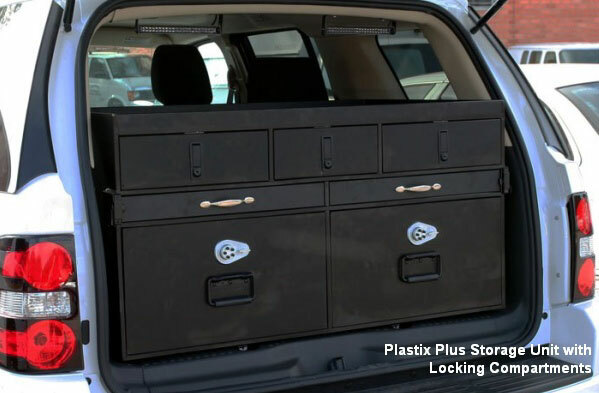 Using CNC design and thermal plastic welding technology, Plastix Plus can create an infinite variety of in-vehicle storage systems with trays, bins, boxes, shelves, and lockable secure storage. Below is a Plastix Plus storage system fitted in the back of an SUV. Note the AR-type rifles stored in a sliding compartment with fast-access locks. Likewise the Hitec plastic is easier on fine gun finishes than metal boxes, and it won’t warp or absorb moisture like wood can. Snow says that his plastic storage systems will last for decades. By contrast, Snow says some fire departments that opted for wood storage systems have been forced to replace or rebuild their storage units after just a couple seasons. Plastix Plus hopes to expand to the general consumer market, providing custom in-vehicle storage solutions for trucks, RVs, and SUVs. 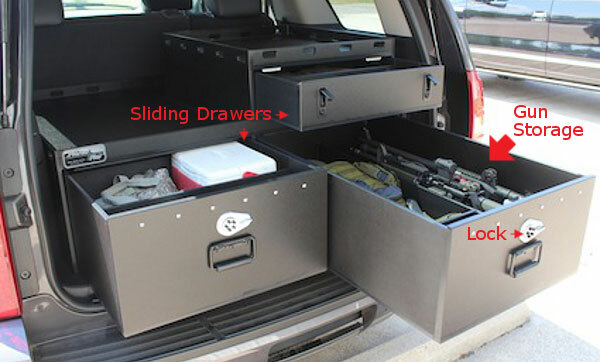 Plastix Plus can match the exact dimensions of your vehicle, providing your choice of drawers, bins, and locking compartments, including gun storage lockers. A custom Plastix Plus storage system is not cheap. But it may be a smart purchase — when you consider the value of the guns and gear you haul around. Your investment in multiple match rifles (with scopes), along with fancy rests, electronics, and accessories, could easily top $15,000. Share the post "Texas Firm Builds Custom In-Vehicle Storage Systems"
Leatherwood/Hi-Lux Optics has added an 8X USMC-SNIPER Unertl-type scope to its William Malcolm Series of vintage-style, externally-adjusting riflescopes. 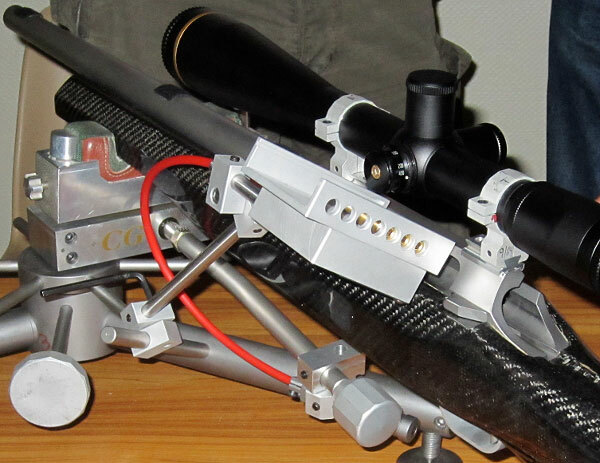 Scopes of this design, with micrometer click external adjustment, were once favored by long range shooters. Today, a mint-condition, original USMC-marked scope can sell for as much as $5,000. And with the current interest in vintage sniper rifles, just a working standard model Unertl scope in good condition can still bring $2,000 or more. Leatherwood/Hi-Lux already markets a variety of long-tube, external-adjusting scopes that are quite popular with BPCR shooters and vintage rifle fans. The new USMC repro scope, priced at $549.00, duplicates the original windage and elevation controls on the 50s/60s-era USMC scope. But the new Hi-Lux offers modern multi-coated lenses. Hi-Lux claims this scope offers the “brightest and sharpest optics ever in a riflescope of this design”. That’s quite a boast — the “real deal” Unertls were pretty darn good. The 8X USMC repro scopes are marked with the “Wm. Malcolm” name over the USMC-SNIPER model designation, and each will be serial numbered — as were the original USMC models. The Marine Corps utilized this style of externally-adjusting scope on sniper rifles during WWII, Korea, and the early stages of the Vietnam conflict. With its $549.00 MSRP, the Hilux USMC-SNIPER repro scope is far more affordable than a serviceable original. Like all Leatherwood/Hi-Lux Optics, the Wm. Malcolm USMC-SNIPER model comes backed with a limited lifetime warranty. If this scope proves to be of decent quality, we expect it will become popular for the growing Vintage Sniper Rifle discipline, which allows reproduction optics. Share the post "Hi-Lux Introduces $549 Unertl-Type 8X ‘Vintage Sniper’ Scope"
Hunters and shooters — along with the firearms and ammunition industry — are among the leading financial contributors to conservation in America, paying for programs that benefit our nation and all its wildlife. Saturday, Sept. 24, is National Hunting and Fishing Day, a day to honor and celebrate the contributions of sportsmen and women. Across the country this weekend Americans will celebrate by attending events, by teaching others about the efforts of sportsmen or simply by enjoying the outdoor traditions they love with the ones they love. To learn more about NHF Day visit www.nhfday.org. Share the post "National Hunting and Fishing Day is Saturday, Sept. 24"
This past weekend we reported that the NBRSA approved the use of the Gonzales cartridge feeder in registered benchrest matches. 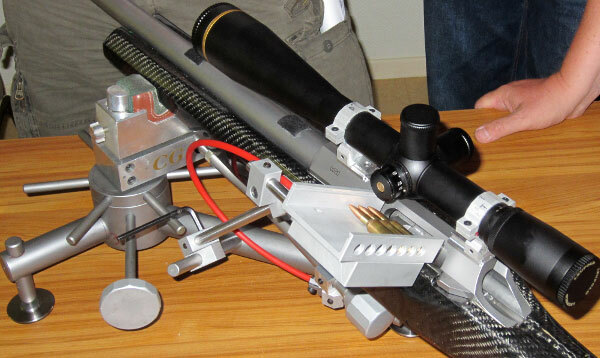 This device, supported by an arm attached to the front rest, holds 6PPC cartridges close to the loading port on the left side of the action. Using a remote (red) cable activated by the left hand, the cartridge feeder drops one cartridge at a time directly into the action. 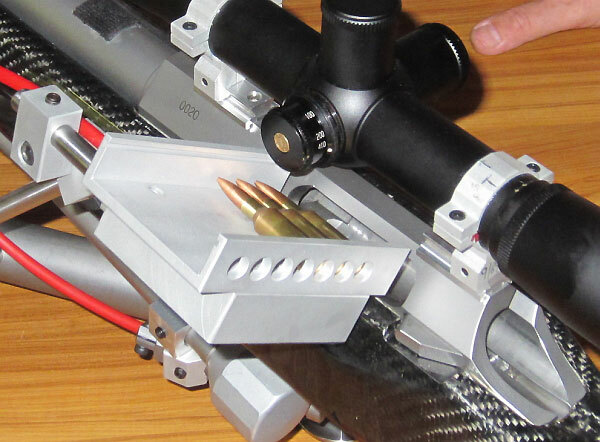 Now, thanks to Rick Pollock of Benchrest.ca, we can show you close-up photos of the device, so you can see how it is positioned and supported. Note that the Gonzales device does not touch the gun. Photos courtesy Rick Pollock, Benchrest.ca. Share the post "New Detailed Photos of Carlos Gonzales’ Benchrest Speed-Feeder"